The Musicianship for Singers class is intended for those with some knowledge of basic theory, (rhythm and pitch) but who wish to build upon this to improve their sight reading and to become more confident in their choral singing. 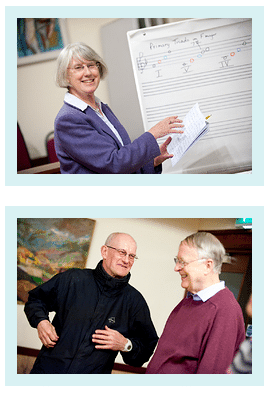 We use exercises and sing music from all periods, often referring to music from the Addison Singers programme. Maybe you are in a choir or perhaps you want to return to singing after a break? The Musicianship for Singers will enable you to polish your sight singing skills and develop your knowledge of music. In this two hour group workshop, theory and practice are mixed to increase your musical know how, confidence and ability. Have fun practising new skills and learning new music! NB: Numbers are limited to 10, and priority is given to existing Addison Singers choir members, so early enrolment is advised to ensure a place. Please enrol online before term starts by first registering here on the Addison Singers website, then purchase a Class membership, click on Checkout and choose a payment method. Sorry - there are no concession rates for Classes, only for choirs. If a member does not take up a place or complete a term for any reason (other than the above) there is no entitlement to a refund. You can however opt to transfer your fee to the following term. If you wish to transfer to another choir or class you need to consult our Membership Coordinator and any difference in the fee or subscription must be paid or be refunded. If you require a receipt for your postal enrolment, you will need to enclose a stamped self-addressed envelope. If you are a taxpayer, current legislation allows us to reclaim basic rate income tax on your membership subscriptions (however not on CDs, class fees or tuition elements). When enrolling please read the Gift Aid declaration and tick the box if you are happy for us to do this. Remember to notify us if you no longer pay an amount of income tax and/or capital gains tax equal to the tax we can reclaim on your donations.